In the US, and many other countries, when a woman marries, the tendency is to take the husband’s name (please do not take issue, offense, or anything emotional with regard to this posting — I am only relating my experiences searching family history documents). Today, whether or not the husband’s name is used is a choice the wife can make one way or the other. In Italy (as with many other countries), women retained and used their maiden name for civil and legal purposes. When researching your family in archives, ship manifests, etc., it is important to remember this custom. Many times you will be searching records for your grandmother, great-grandmother, etc using her married name and not finding her. Try using her maiden name — I have seen many success stories wherein (names are fictitious) someone is searching for great-grandma Maria Fellin, wife of Giuseppe Fellin, and mother of Arcangelo Fellin. No luck. But, searching for Maria Endrizzi (maiden name), she is found on the manifest accompanied by son Arcangelo Fellin, with a destination of Pennsylvania to join husband Giuseppe Fellin. Subsequent trips back home to visit family will likely have her listed as Maria Fellin, based on the naming conventions in the US. The use of maiden names in Trentino birth and marriage records can provide significant leads to additional generations. Most often, not only will the names of child’s father and mother (with maiden name) be given, but also the names of the father’s and mother’s parents. Thus, this one entry will give the names of parents and grandparents, including the maiden names of the grandmothers. From here, cross-checking the parents and grandparents with marriage records will lead to even more information (don’t forget that in small Trentino villages there was not much migration outside the area until the late 1800’s)..
A large number of birth records in Trentino during the 1800s were preprinted templates, with columns for noting whether the child was legitimate or illegitimate (the birth, marriage, death records were maintained by the church for hundreds of years). If a child was illegitimate in the eyes of the church (e.g. parents either not married or not married in a church), a mark was made in the “illegitimate” column. A common practice (one we would see today as discriminatory) was to record the mother’s name, but not the father’s name. This would often lead family history researchers to a serious stumbling block or a deadend in tracing their ancestry. Prior to the use of preprinted templates, birth records were handwritten in date order, and usually consisted of a paragraph of data. Often these records were even more “double-standard” than the later records. For example, one of my ancestors was born in the village of Castello di Fiumme in 1806. 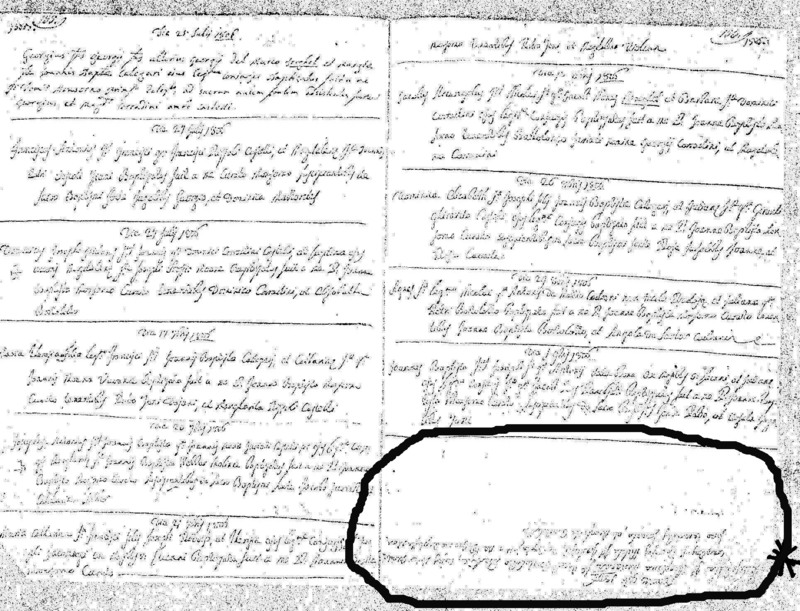 Her birth record (in Latin) not only mentioned she was illegitimate and omitted the father’s name, but of the eleven births record on that handwritten page, hers was the only record written upside down !!!!! There were subsequent births, and each was marked as “illegitimate”. Was she actually unmarried or married but not in church? I don’t know, and other than not having the father’s name for purposes of further research, not an issue. A copy (albeit a very poor one) of that record is shown below. This entry was posted in Culture, Genealogy and tagged ancestors, birth records, genealogy, Trentino. Bookmark the permalink.